. In a soup pot, sauté the onion, celery and carrot in the oil over medium heat until the onion is golden, about 5 to 6 minutes. Add the squash and garlic cooking 5 minutes, stirring. Add the oregano and stock and simmer about 15 minutes or until the veggies are soft. While the soup is cooking, place a sauté pan at medium-high heat with 1/2 teaspoon of olive oil and sauté the diced onions. Cut the apple into a large dice and when the onions are golden, add to the pan, toss sautéing 2 to 3 minutes. Add the curry and cook 1 minute. Remove from the heat, add the dill (optional) and set aside. Place all of the cooked veggies (except the curried onions and apple mix) and liquid from the pot in a blender or food processor and blend until smooth. More stock may be needed to adjust consistency. Return to the soup pot and add the curried onion and apple. Simmer for 2 minutes. Season to taste and adjust consistency. Serve hot or chilled. Garnish with a dollop of yogurt and a sprig of fresh dill or onion tops. Thanks for your sharing - delicious - 5 !!!!! Lovely looking soup. Bookmarked and printed out! Both Candy and I love soups like this. FIVE from both of us! Thanks for posting! This could be a great change up from chicken noodle soup. Five forks! 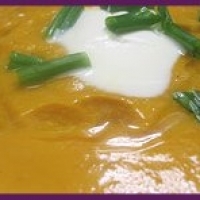 I love squash soups, so delicious! Thanks for posting! Have a great weekend! A great soup for wintertime...and what a coinky dink...I happen to have a butternut squash sitting on my counter! Bookmarking! I love these winter soups and this looks great. Bookmarked! That looks beautiful, creamy and dreamy! And with the holidays coming, is a great soup to make.